As reviewed by Traverse (1988b), stratigraphic palynology had its beginning as a field of study (originally called pollen analysis) in the early 1900s with the microscopic investigation of Pleistocene peat deposits in Europe. The development of palynology in pre-Pleistocene stratigraphy began in the 1940s, but its application to studies of Cretaceous and Paleogene rocks in North America did not take place until later with the research of Rouse (1957) and Stanley (1965). By the late 1960s it had become clear that palynomorphs, which occurred in vast numbers and in seemingly endless morphologic variety, were useful tools for determining the stratigraphic position of the K-T boundary (although the significance of that horizon with regard to a mass extinction event affecting plants was unknown at the time). 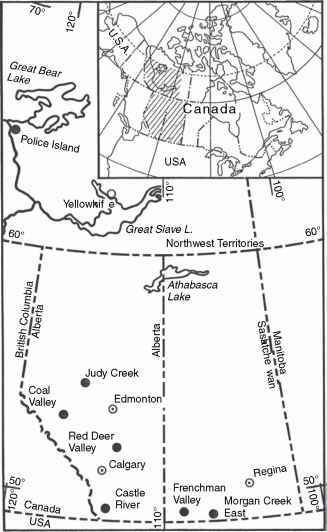 Two important papers were published in the early 1970s in a Geological Society of America Special Paper devoted to the K-T boundary (Leffingwell 1970, Tschudy 1970); these papers will be discussed in detail later (Chapter 7). Thus, by the 1970s the value of stratigraphic palynology in K-T boundary studies was firmly established, and it was becoming evident that palynology also increased the capability of sampling the fossil plant record. Palynology helped to pinpoint specifically the stratigraphic position of the K-T boundary in the early 1980s (Orth et al. 1981), which led to significant new data on the effects of the K-T boundary event on plants (see Sections 6.3 and 7.2). Palynology was used in conjunction with megafossil paleobotany at the K-T boundary for the first time in the 1980s (Hickey 1981, Wolfe and Upchurch 1986, Johnson et al. 1989). Palynology is now the primary tool for locating the K-T boundary in nonmarine rocks.